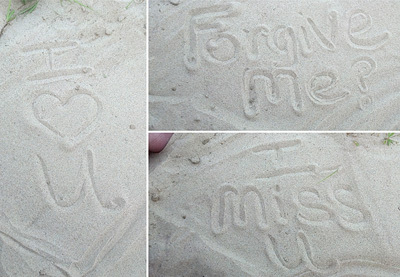 I wrote, "Forgive me," to my husband in the sand at a beach. Took a pic on my phone and texted it to him. That's after a multi-shot photo of hand written letters saying how sorry I am and that I love him. We have been together off & on for 10 years & 4 children. On February the sixth 2012 we finally got married. It's been a rough 11 years. There's been violence and abuse the whole time. 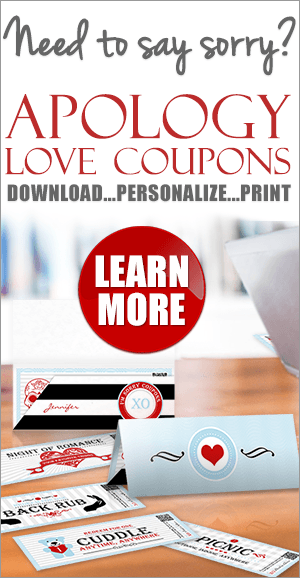 The first year of our marriage was spent more off than on. We had been separated for about 3 and a half months when I met an older man through work. This older man I thought was everything that I needed from my husband. We became close friends. One thing led to another and I had an affair. I was nauseated, ashamed, broken-hearted, angry, and extremely sad at what I was doing. Even though I had filed for divorce 3 or 4 months prior. I just felt wrong. On a weekend visit my husband found and read my journal. That's how he found out about the affair. Now he sees how I felt all these years. Hurt, betrayed, rejected. I still felt bad so that's how I apologized. My husband is the love of my life. I'll never love him like I used to before the hurt and pain but I will love him forever. Being by the ocean always puts things in perspective. Sometimes those that we love, like your husband, are not the best people to surround ourselves with. I hope that he saw the error of his ways when he saw your journal and apologized to you for all the hurt and pain he caused you. I also hope that he has learned that he needs help and is seeking counseling. Being abusive to another person is not about what that person does or how they act, it's about not dealing with your own shortcomings or disappointments with yourself and taking it out on others. I read somewhere that when someone points a finger at you they are pointing four back at themselves. I thought it was very profound. Your actions may or may not have been justified but please don't feel like you were the only one at fault. Your actions, by what you wrote, sound like a reaction to your circumstance and situation. The fact that you felt sad about what you had done and still loyal to your husband (even though you had previously filed for divorce) and took the time and made the effort to apologize says a great deal about your character. By the way, I thought an apology written in the sand and sent to the recipient is very sweet and touching. I wish you all the best that life has to offer and a very happy journey moving forward.